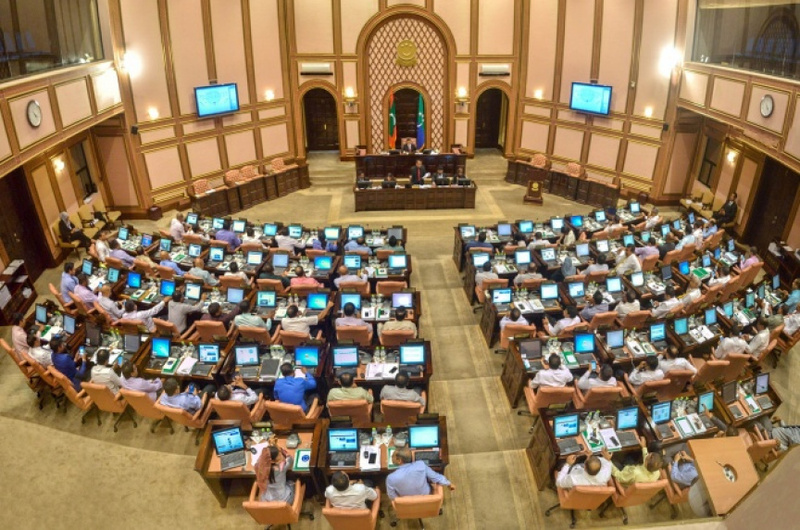 The People’s Majlis has passed the reforms proposed to the Elections Act and Presidential Elections Act by ruling Progressive Party of Maldives (PPM). Voting was postponed twice during the Majlis sitting held this Wednesday due to lack of quorum. The Majlis Speaker finally proposed a motion to hold the votes despite lack of quorum, citing extenuating circumstances. The motion passed with the vote of 31 lawmakers. The Majlis passed the reforms to Elections Act and Presidential Elections Act with the vote of 35 lawmakers. The Majlis voted on total three bills; one reform to the Elections Act and two reforms to the Presidential Elections Act. Fares-Maathoda MP Hussain Mohamed Latheef’s Bill on Presidential Elections Act is to raise the minimum deposit for presidential candidates from MVR 40,000 to MVR 100,000. And to raise the fee for parliament candidates from MVR 5,000 to 15,000. Vilimale’ MP Ahmed Nihan Hussain Manik’s Bill on Presidential Elections Act is to ban anyone who has been a citizen of another country from running for presidency for at least 10 years after he surrenders his citizenship. And a ban on anyone with asylum in another country from running for presidency. Majlis also voted on the Bill on Elections Act to consider any ballot papers with scribbles on it to be considered invalid. Lawmakers voted that ballot papers with scribbles on it will be considered invalid if the designated candidate is unclear.